With the Rugby World Cup in full swing, we teamed up with marketing agency Further to produce this interactive infographic to highlight key facts and figures for fans. 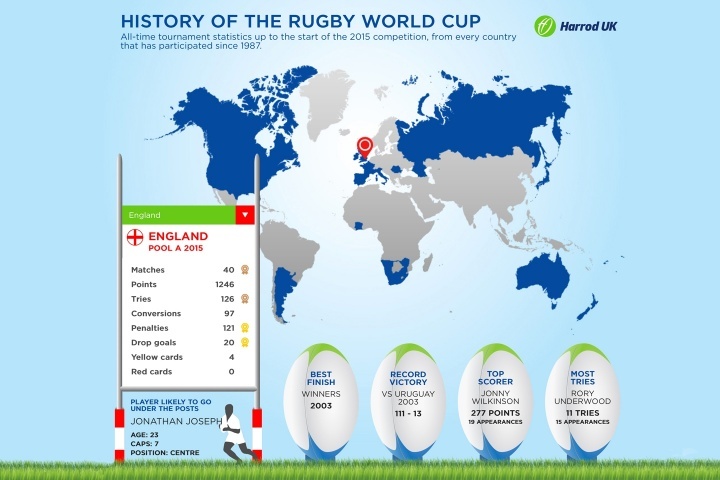 To celebrate being the official manufacturer of this year's Rugby World Cup goal posts to participating stadiums in England and Wales, we created an infographic which delves into the history of the sporting event since it began in 1987. Statistics include: the number of matches each country has played, their top scorer, the number of tries, points, conversions and penalties. The infographic has highlighted some interesting statistics for England. The team has scored the highest number of penalties (121) in comparison to other participating countries and in addition came in third for the highest number of matches played (40) and the number of tries (126). "We created this infographic to give fans the opportunity to easily access vital statistics about their country or team of choice. I'm positive it will help fuel friendly debate and speculation about this year's potential winners and losers." "It's not surprising to see Jonny Wilkinson is England's top scorer after achieving 227 points from his 19 appearances since the Rugby World Cup began. Will history repeat itself this year with England drop kicking their way to victory in the Grand Final, just like in 2003? I do hope so, especially given we have manufactured the posts!" For more information about Harrod UK visit https://www.harrod.uk.com/about or call 01502 583515.